We would also like to thank our users for using the automated error reporting that we included in the 3.8.2 release and for sending us all those error reports. We used them to fix issues and improve reliability in this release. And we will continue to do that. So please keep those error reports coming! The default STS distribution is now based on the recently released Eclipse Neon.2 (4.6.2) release. The latest Pivotal tc Server release 3.2.2 is now included in the STS distribution bundle. If you unpackage the STS archive on macOS Sierra and use it without moving it to a different location on your drive, macOS Sierra Gatekeeper activates a security feature called "Path Randomization" for the app. This causes the STS.app bundle to be copied to a private and randomized read-only folder on your disc every time you start STS after a restart of your machine. As a result, all your third-party installs are lost as well as your global configuration. As a workaround, please move the STS.app bundle to a different location on your drive before starting it. The default STS distribution is now based on the recently released Eclipse Neon.1 (4.6.1) release. There is a nice 4min video on YouTube about noticable updates and improvements in Neon.1, alongside various bug fixes that went into this release. The latest Pivotal tc Server release 3.2.0 is now included in the STS distribution bundle. 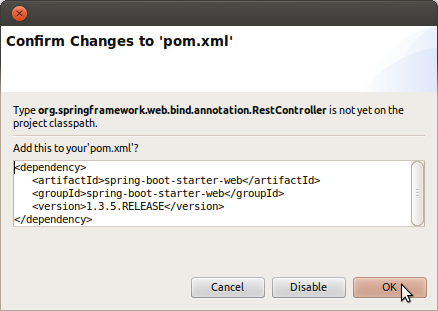 The Spring Tool Suite now comes with automatic error reporting being included in the distribution. 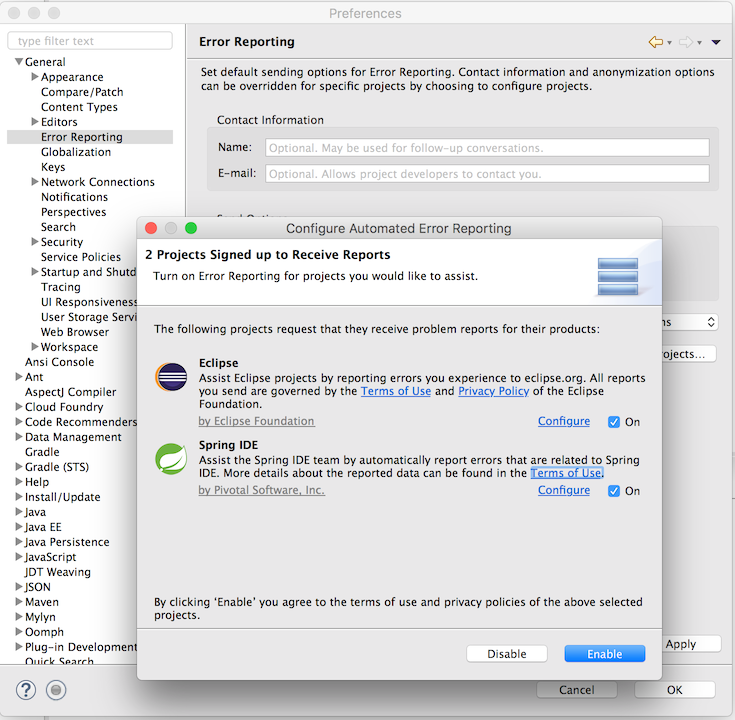 This allows you to report errors that happen under the hood of the IDE automatically to the development team. In case you use the nice integration of Cloud Foundry into the boot dashboard, you are now able to select the way the boot dashboard should remember your CF credentials. You can choose to not store the credentials at all, store them in the secure storage facility that is provided by Eclipse, or (and this option is new) to use an oauth token (which is stored by the boot dashboard in a local file). The content assist for Cloud Foundry manifest files provides nice content-assist for various property values. For the buildpack option those content-assist values are dynamically inferred from the configured Cloud Foundry targets in your boot dashboard. 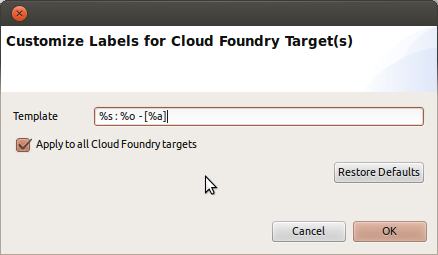 While this is easy and convenient while using a single Cloud Foundry target, it can be confusing if you use various Cloud Foundry targets from different CF installations, since those can each provide a different set of available buildpacks. To avoid this confusion, the boot dashboard now shows additional information if a buildpack is available only on a certain set of Cloud Foundry targets. It is now possible to specify the URL of the Spring Initializr instance that the Spring Starter Project wizard should use via the preference settings at Spring -> Boot -> Initializr. 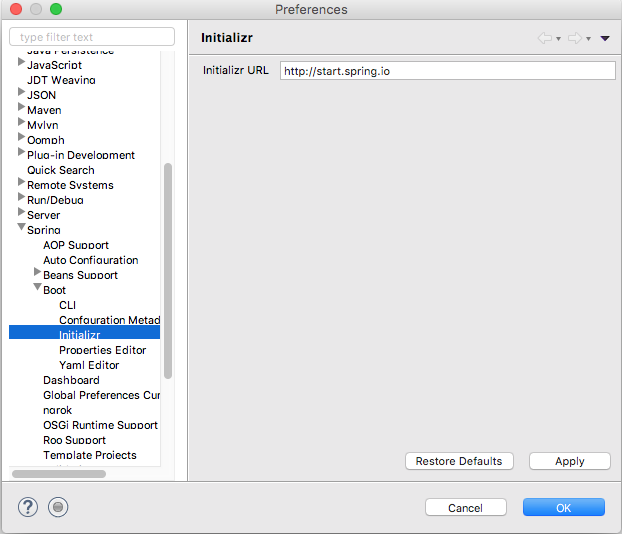 This is extremely useful if you use your own, customized version of the Spring Initializr app in-house and would like to use that directly in STS. `Make Default` - allows you to preset selected by default starter project dependencies for the next time the wizard is opened. `Clear Selection` - clears currently selected starter project dependencies. The latest Pivotal tc Server release 3.1.5 is now included in the STS distribution bundle. STS 3.8.0 requires a JDK 8 to run properly. The default STS distribution is now based on the recently released Eclipse Neon (4.6) release. 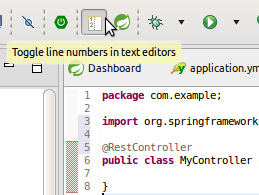 Highlights from this Eclipse Neon release include substring code completion for Java content assist, word-wrap in text editors, commands/shortcuts/pinch gestures to zoom into text editors (especially useful when giving presentations), and more. Please find additional details in the Eclipse Neon New and Noteworthy. The latest Pivotal tc Server release 3.1.4 is now included in the STS distribution bundle. The support for Spring Insight that was part of the tc-server support got removed. We added a plugin from Eclipse Buildship to notify our users of using Eclipse Buildship instead of the legacy STS support for Gradle in the future. In case you don't remember those placeholders, don't worry. You can hover over the text field for some help. 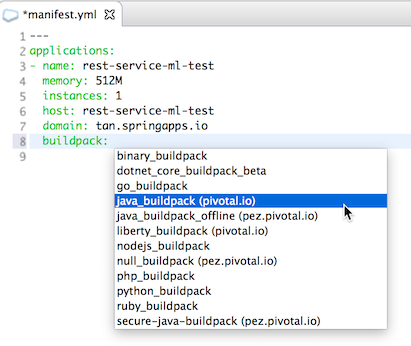 A single manifest.yml may specify deployment properties for multiple applications. When deploying an app, the Deployment Properties dialog's YAML Content section highlights application names and allows the user to choose one, by clicking on the visual annotations in the vertical ruler. The Cloud Foundry Target creation wizard and login dialog now have a "Remember Password" check-box. 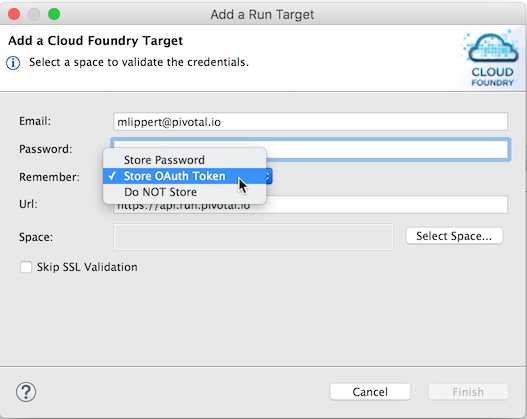 If you choose not to remember the password then you will be prompted to enter Cloud Foundry login credentials when connecting to the Cloud Foundry target or after restarting STS. Otherwise, the password will be stored in Secure Storage and you will not be prompted to enter the password again. Note that on Linux, you will still be prompted for the Secure Storage master password. 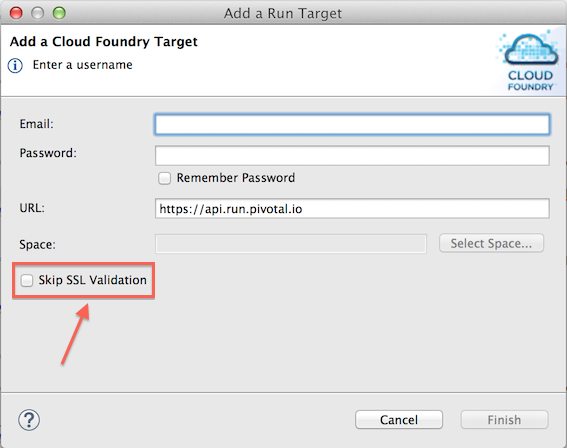 Skipping SSL validation is now supported when creating Cloud Foundry targets in the Spring Boot Dashboard. The filter in the boot dashboard is now also aware of project names. No need to organize your projects into working sets anymore, just type in a part of the project name and see the filtered list of projects in the boot dashboard. Based on input from Spring Boot Core developers we have created some code templates useful in developing Spring/Spring Boot apps. 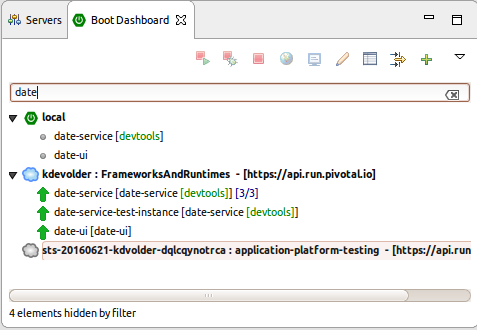 The templates are invoked through Eclipse's content-assist (i.e. you press CTRL-SPACE) and shown as completions when you type the template's name (or even just a part of the name). Some templates are context-sensitive. This means that there are multiple versions of the template that expand into a different pattern depending on the context you are in. For example the notnull template expands to something that uses JUnit's assert in test code; it expands into something that uses Spring's assert anywhere else. "Jar Type Search" is a feature that was introduced in STS 3.5.0. It provides content-assist proposals in Spring Boot projects, for types that are not (yet) on the classpath. 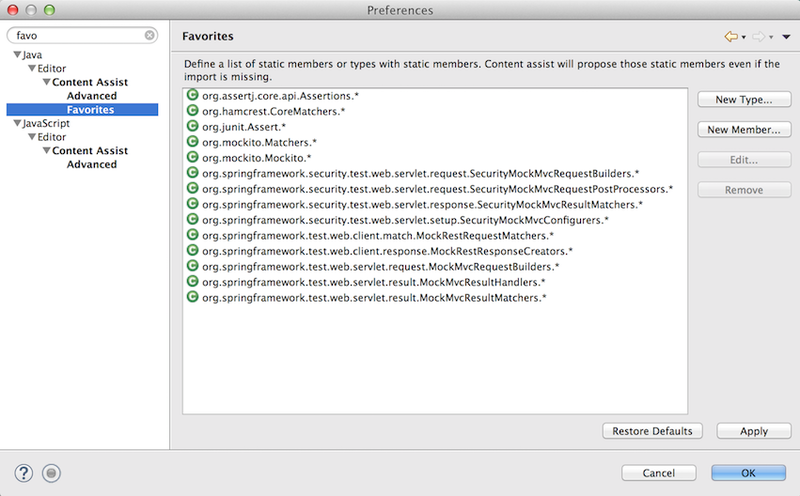 When selecting such a proposal the required dependency is automatically added to the project's maven pom. Some people liked this, but others found it confusing or annoying rather than helpful because it was too easy to add undesirable elements to a pom accidentally. STS 3.8.0 addresses this by asking for explicit confirmation before making changes to your pom. The confirmation dialog also has a "Disable" button, which you can click to disable it completely. Both the yml and properties editor now provide a quickfix for deprecated property names (if the property defines a replacement in its metadata). Both the yml and properties editor now provide some basic content assist for configuration properties of type org.springframework.core.io.Resource. Content assist suggestions are generated by scanning your project's source-folders for 'resources'. In a future release we may extend this to do a broader scan to look also for 'resources' in the project's dependencies. The editor now understands what this means and will suggest names of classes that implement the FieldNamingStrategy interface from the project's classpath. Handle-as value provider can be used in spring-boot configuration property metadata to designate that a property ostensibly declared as a vanilla type such as String should be treated as something more specific (e.g. org.springframework.core.io.Resource). Both yml and properties editor now understand this metadata. Note 1: Hyperlink navigation with 'CTRL-Click' now also works for enum values, taking you to the source-code of the corresponding enum constant. Note 2:JavaDoc in Eclipse in general, is only available when source-jars have been downloaded and associated with the binary jars. If you do not get JavaDoc hovers where you expect them, verify that source code for the enum in question is attached before reporting this as a bug. 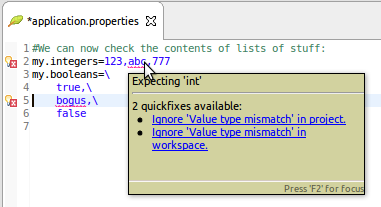 Note 3:There are still cases, especially in the properties editor, where hover-info and/or CTRL-click does not yet work, in particular when the enum-value occurs on the left-hand-side of the '=' of a property-assignment. We plan to resolve these issues in a future release. Content assist for buildpacks now proposes buildpacks dynamically from Cloud Foundry targets in the Spring Boot Dashboard. 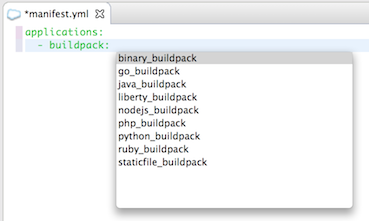 It will list buildpacks from any Cloud Foundry target, not just Pivotal Web Services. We implemented a number of little things to improve the general developer productivity when working with the Spring Tool Suite and Eclipse. Here are the little improvements in detail. Want to rename tests, too? After you rename a class, STS will check if there is a test class with a similar name. If it finds one, it will ask you if you want to rename that too. Additional default types containing static members have been added to Content Assist for imports, including some from springframework libraries. Users can customize the list through "Favorites" preferences, as well as restore the default list. 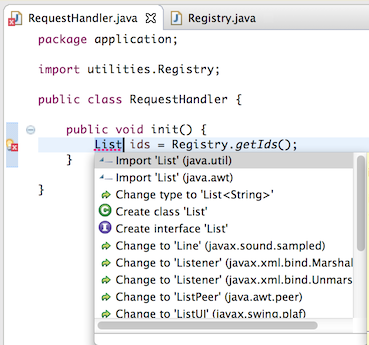 Quickfix on unresolved Java types now matches the return type of an assignment statement. STS 3.8.0 requires a JDK 8 to run on top of. If you are running it with an older JDK this may not be immediatlely apparant, but some of STS functionality will simply be 'absent' because the corresponding plugins are automatically disabled by OSGI because their requirements are not satisfied at runtime. See also below 'Setting the JDK'. STS 3.8.0 requires a JDK 8 to run on top of. Nevertheless the native Eclipse launcher component might pick up a JRE or an older JDK automatically if you don't specify which JDK to run STS on top of. To avoid this, you can specify the JDK in the sts.ini file that comes with your STS installation. Add a line at the beginning "-vm" and an additional line below that which points to the "javaw" executable of the JDK on your machine.